Ergh... Be forewarned, this is another pointless, potentially whiny post intended to allow me to procrastinate rather than do something useful. Well, March is almost over already. I can't say I accomplished much more this month than I did last month. Unfortunately, I can't use the February Bug as an excuse this time. Just can't seem to get my brain to lock into a gear. Story editing has hit another lull, as I grind back and forth between actually editing my rough draft and simply rewriting it in scattershot, first-draft style. I keep telling myself that it's a necessary evil, to patch up serious plot structure and pacing issues, and not me falling back into old habits as a crutch, but I'm not at all sure that's the case. I want a finished second draft by November at the absolute latest, but the more I waver on whether or not I'm progressing, the less actual progress I'm making. My sketchbook's stagnating, with barely a page a day getting filled; I want to be drawing more from my mind, maybe nail down a few book scenes and characters, but once again I find myself wavering between teach-yourself-to-draw studies and lousy-crud-from-the-imagination thumbnails. Neither seems to be getting me far. Right now, I've given priority to a project that has an actual deadline (it's for someone else; the annual camp logo - a.k.a. my annual skirting of potential copyright infringement hell.) Unfortunately, the theme is nothing to make the ol' pencil leap and dance across the paper. Sometimes, I wonder if the staff deliberately picks ideas without a smidgen of inherent interest. But, a job's a job, a theme's a theme, and like it or not it needs doing. Once it's done, I tell myself I jump back into my sketchbook with a vengeance, to make up for time lost wrestling with a theme that makes "Watching Paint Dry" seem fascinating and dynamic. As for my other hopeful March projects - sprucing up my websites, rearranging my room, fooling with my budget program, researching Etsy, and so forth - well, somehow they all ended up piled on the back burner. How they got there, I don't know, as I honestly can't say I see anything significant on the front burner to displace them. But there they sit, cold and congealed, frosted with dust and specks of mold. Just a brief update to waste time while adjusting to the Missing Hour. The February Bug has pretty much retreated to an occasional squeeze in the sinuses. I finally felt secure enough to start up the Claritin again. I didn't want anything to possibly interfere with my immune system while fighting the bug, and I have a vague, twisted idea that allergy medication might alter immune response, since allergies seem to be an overreaction of the immune system to unharmful stimuli. My relatives, on the other hand, aren't so lucky. My sister's ears are still clogged, and her sinuses and throat aren't done yet. My mother was feeling better, but it's gone back to lurking in her throat again. Hopefully, the danged thing clears out of the house soon. Illness makes people cranky... well, crankier than usual. I'm getting back on track with my various trivial goals in my trivial life. I just made my first relatively major change in the story I'm editing, which feels much more productive than just opening the file and staring at random sections like I had been doing. (Whether or not the change helps, well, that's for Draft 3.) I still have some pacing issues to deal with. I also have a vague idea that I can manipulate things so that the story doesn't need a sequel; has to do with relocating events in the finale, and possibly delaying them via a few more catastrophes. I'll burn those bridges when I get there, though... right now, I've just started Chapter 9, where the main character has to recover from attempted murder and a close call with death by dragon fire. Half the fun of writing is tormenting imaginary people. Other than that, I can't say I have much to report. Just thought I'd post to let all none of you know I'd shaken the worst of the bug. I still never found February, though... I think it went wherever the Missing Hour goes after the time elves sneak into our houses and steal it from our clocks. And the daisy? Eh, I just shot the picture at a local park a few weeks ago. 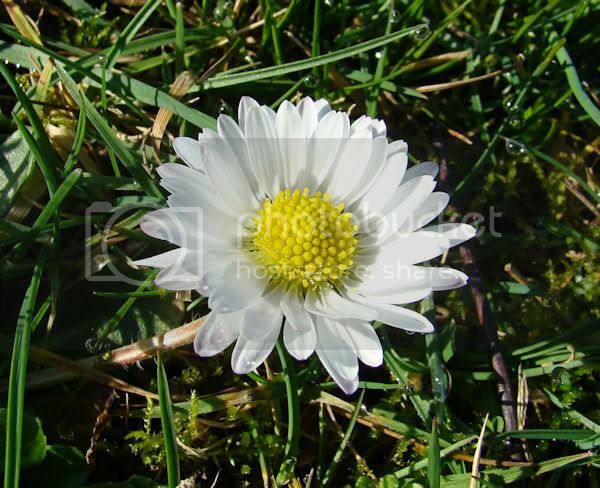 Little daisies in the grass always mean springtime to me. Mainly, though, I thought it would help dull the pain of trudging through a pointless blog post if there was a pretty picture to look at.